During our last product sourcing trip, the Artifactio team specifically sought out the famous lacquer coconut shell bowls that are a common sight in many markets across Southeast Asia. We have seen them at markets across Thailand, Vietnam, Myanmar and Laos. Unfortunately, these stunning items are not always displayed in the best possible way. They are often stacked high gathering dust among a million other trinkets. These beautifully hand-painted and lacquered coconut shells are a favorite among travelers. Not only are they an ideal keepsake to bring back home but they are also light, robust and relatively inexpensive. Most importantly, these coconut shell bowls allow you to bring a part of your rich cultural travel memory back home! 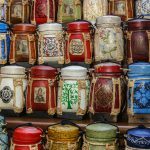 Much like our Thai rice boxes, these bowls are guaranteed to brighten up any kitchen or living room with a touch of Asian flair. 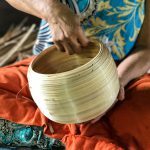 Coconut Shell Bowls – How are they made? These beautifully handcrafted bowls are made from coconut shells from the uniquely tropical coconut tree found in abundance in Southeast Asia. The shells are essentially a bi-product (or waste) after their coconut oil, flesh and water has been extracted. Our artisans start by carefully selecting, cutting, cleaning and sanding the coconut shells. The outside surface is simply sanded down smoothly and varnished to reveal the beautiful and natural grain of the shell. They are then each individually and meticulously hand-painted or decorated with mother-of-pearl (shell) segments to create unique and stunning designs. Finally, the inside design is coated with several coats of clear food-safe lacquer to give them their nice shine. The outer side of the coconut bowl is then finished with an organic virgin coconut oil polish. 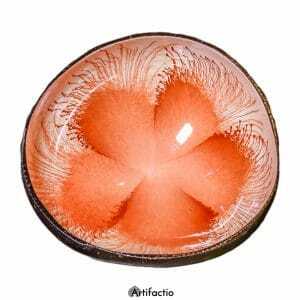 Being a natural product, each bowl is unique in shape but they are typically approximately 13cm in diameter and 6cm high. Each design motif comes in a variety of colors to suit every decorative environment in a home or office. Whilst the coconut bowls themselves are quite strong, we do not suggest that they are placed in the dishwasher. Simply hand-wash and dry them after use. 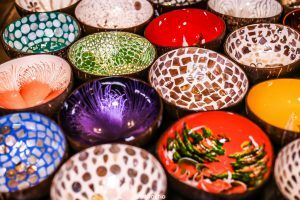 Coconut Shell Bowls – what can they be used for? There is no limitation to their potential uses – they are certainly food friendly and water resistant and therefore ideally suited for serving food. Try serving snacks, salsa, chocolates or (my personal favorite) ice cream! But they are also great for holding keys or stationary or they can be used to float candles to accentuate their colors and lend ambiance to any room. Their striking color with a high-gloss shine will add a sparkle to any table. Anyone who has visited Southeast Asia will be able to attest to the sheer mountains of coconut shells that are heaped up alongside beachfront restaurants. Every year, literally billions of coconuts are harvested for their coconut oil, water and flesh. Whilst these are wonderful products, unfortunately the vast majority of the “waste” shells are simply discarded and burned as waste. While coconut husk (the hairy outside of the coconut shell) is an attractive biomass fuel and a good source of charcoal, the smoke from burned coconut shells is an environmental hazard due to the resulting CO2 and methane emissions. For this very reason, we only work with reliable artisans and suppliers who carefully reclaim their coconut shells after their flesh and water have been extracted. Being so versatile, beautiful and environmentally friendly our loyal customers rarely purchase just one – we recommend a set of 3 or 6! Artifactio is a team of ex-corporate professionals with a passion for culture, art and outstanding online experiences. 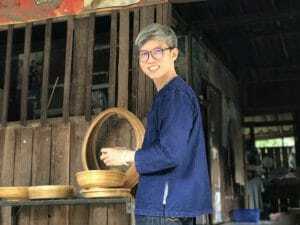 Their aim is to bridge the gap between local communities in Southeast Asia producing amazing handmade artifacts and the online shopping community, one artisan at a time. Fantastic and beautiful ! Cannot decide which are the most wonderful ones! What is the cost? Thank you Evelin! Agreed, they are all very beautiful which makes it difficult to decide on just one. We suggest ordering several with different designs to use around your house or office. They’re only US$ 4.99 each and we’d be happy to give you one free for every three you order! Want to buy some bowls, but cannot find the shop link? Unfortunately we no longer sells bowls.